Discussions between an applicant and an examiner are often indispensable to advance the prosecution of a patent application. Generally, interviews that improve the mutual understanding of specific issues in an application should be promoted. Properly conducted, an interview can bridge the gap between an examiner and an applicant with regard to the substantive matters at issue in an application. Interviews often help to advance prosecution and identify patentable subject matter. The applicant and the examiner should consider the advantages of conducting an interview to advance the prosecution of a particular patent application. Positions presented during an interview should be advanced with decorum and courtesy. An interview should be granted when the nature of the case is such that the interview serves to develop or clarify outstanding issues in an application. Both applicants and examiners should understand that interview time is limited for both, and therefore they should use the interview time efficiently. Both parties should ensure the interview does not extend beyond a reasonable time and minimize interruptions during the interview. Applicants and examiners should facilitate the grouping of interviews where effective. All discussions between the applicant/practitioner and the examiner regarding the merits of a pending application will be considered an interview and are to be made of record. This includes any and all records or communications received in connection with the interview, whether the interview was conducted in-person or through a telephone conversation, video conference, electronic mail, or electronic message system. This policy and other interview tips are detailed in the Interview Best Practices document which is available at www.uspto.gov/patents/law/exam/interview_ best_ practices.pdf. Where an electronic record is created as part of the interview, e.g., a series of electronic messages, a copy of the electronic record is to be made of record in the application. Where an electronic record is not created a summary of the interview must be made of record. (1) Interviews with examiners concerning applications and other matters pending before the Office must be conducted on Office premises and within Office hours, as the respective examiners may designate. Interviews will not be permitted at any other time or place without the authority of the Director. (2) An interview for the discussion of the patentability of a pending application will not occur before the first Office action, unless the application is a continuing or substitute application or the examiner determines that such an interview would advance prosecution of the application. (3) The examiner may require that an interview be scheduled in advance. (b) In every instance where reconsideration is requested in view of an interview with an examiner, a complete written statement of the reasons presented at the interview as warranting favorable action must be filed by the applicant. An interview does not remove the necessity for reply to Office actions as specified in §§ 1.111 and 1.135.
i) Face-to-face interviews may be accomplished via video conferencing or in-person. The physical location of either party participating in an interview should not limit the USPTO’s ability to hold face-to-face interviews. A request for a face-to-face interview will normally be granted. Other times, a telephone interview provides an appropriate level of interaction. ii) In-person interviews with the examiner should normally be granted. In-person interviews must be conducted on the Office premises, such as in an examiner’s office, a conference room, an interview room or a video conference center, and should be held during normal business hours of 8:30 a.m. – 5:00 p.m. Monday through Friday. iii) Interviews other than in-person interviews should be held during normal business hours and may also be held during mutually agreed upon non-traditional business hours, such as Saturday and evening hours. iv) When an examiner is working remotely from a USPTO campus, there may not be an opportunity to have an in-person interview. The examiner shall accommodate an applicant, attorney, or agent’s preference for an interview via telephone conversation, video conference, electronic mail, or electronic instant message system using USPTO-based collaboration tools, consistent with the special requirements of section II. below. Alternatively, an applicant, attorney, or agent may request to have an interview on a USPTO campus while the examiner is remotely participating via the phone or video conference. In this instance, appropriate arrangements will be made on the USPTO campus for equipment and/or internet access to facilitate the interview. Appropriate USPTO representative may be present with the applicant during the on campus interview. v) Any Examiner may, with the applicant’s consent, conduct an interview by using video conferencing and collaboration tools provided by the Office. vi) Examiners who normally work remotely should arrange to hold an interview on campus if the timing can be mutually agreed upon with the applicant. In special situations the examiner will be required to travel to campus for an in-person interview. The decision on special situations will be made at the TC Director level or higher as to whether the examiner of record or another USPTO representative will be on campus for the interview. A hoteling examiner within the local commuting area of a satellite office may use that satellite office for in-person or video conference interviews. vii) Examiners working on campus may hold interviews in-person, telephonically, or via video conference. Examiners may receive requests from an applicant for an interview using video conferencing. Such requests should normally be granted. See MPEP § 713.01, subsection III below. Telework does not prevent examiners from conducting interviews via video conference or telephonically from their approved alternate worksite. Internet email, instant message system, or video conferencing shall NOT be used to conduct an exchange or communications similar to those exchanged during telephone or personal interviews unless authorization from the applicants or an attorney/agent of record has been given to use Internet communications. See MPEP § 502.03. The best practice is to have a written authorization of record in the file. However, an oral authorization from the applicant/practitioner is sufficient for video conferencing interviews. The oral authorization is limited to the arrangement of video conference interview (including the meeting invitation) and does not extend to other communications regarding the application. The examiner should note on the record the details of the oral authorization in the interview summary or in a separate communication. i) A video conference is a meeting, usually via the Internet, using USPTO-supplied collaboration tools to visually interact and collaborate with people anywhere in real time. ii) All video conferences for interviews MUST originate or be hosted by USPTO personnel. Examiners may not conduct interviews via video conferences hosted by applicants or third parties. The examiner assigned to the subject application should coordinate the video conference using USPTO-supplied collaboration tools. iii) When an applicant requests a video conference with an examiner, the request should normally be granted. When applicants request an in-person interview but there is not an opportunity for both parties to be on the same USPTO campus at a mutually agreed upon time, a video conference should be offered. All examiners, regardless of worksite location, should offer and hold interviews via video conferencing when appropriate. iv) Video conferencing should be conducted consistent with the special procedure of subsection II above. Authorization from the applicant, preferably written, should be obtained prior to scheduling and setting up a video conference. See MPEP § 502.03. An interview, whether by video conference, over the telephone, or in person, should be arranged for in advance to insure that the primary examiner and/or the examiner in charge of the application will be available. 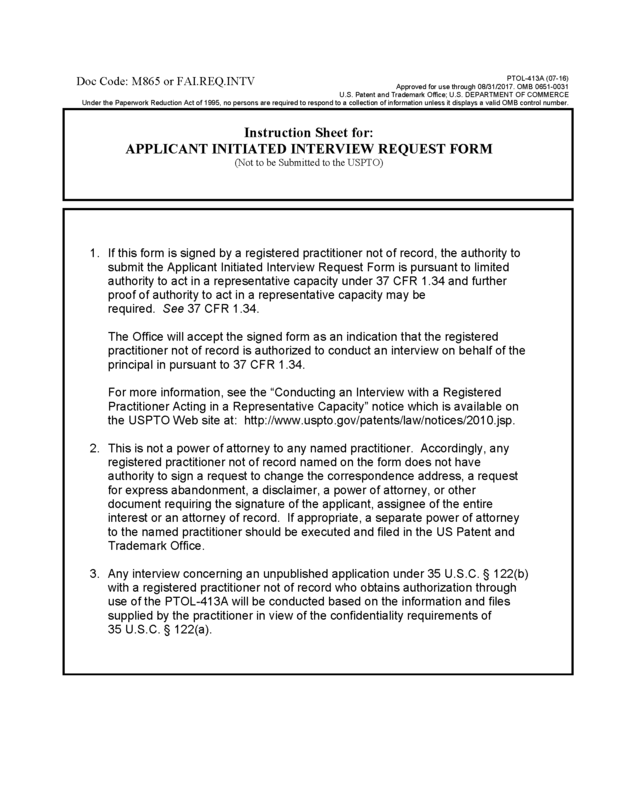 Use of the USPTO’s Automated Interview Request (AIR) at www.uspto.gov/interviewpractice is encouraged, but in the alternative, the examiner may be contacted by letter, facsimile, electronic mail, or telephone to schedule the interview. An "Applicant Initiated Interview Request" form (PTOL-413A) may be submitted to the examiner prior to the interview in order to permit the examiner to prepare in advance and to focus on the issues to be discussed. This form should identify the participants of the interview, the proposed date of the interview, whether the interview will be personal, telephonic, instant message system or video conference, and should include a brief description of the issues to be discussed. 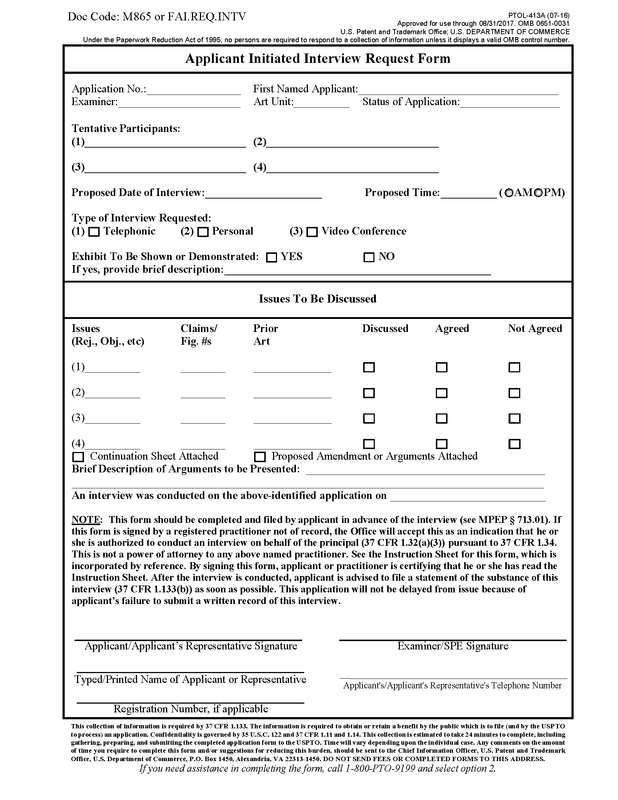 A copy of the completed "Applicant Initiated Interview Request" form should be attached to the Interview Summary form at the completion of the interview and a copy should be given to applicant or applicant’s representative. When a second art unit is involved, such as in the case where approval of a Patentability Report is necessary, the availability of the second examiner should also be checked. See MPEP §§ 705 - 705.01(f). An appointment for interview once arranged should be kept by examiner and applicant, attorney, or agent. When, after an appointment has been made, circumstances compel the absence of a party necessary to an effective interview (e.g., applicant, applicant’s representative, or examiner), the other party should be notified immediately so that substitute arrangements may be made. When a telephone call is made to an examiner and it becomes evident that a lengthy discussion will ensue or that the examiner needs time to restudy the situation, the call should be terminated with an agreement that the examiner will call back at a specified time. Such a call and all other calls originated by the examiner should be made through the Office’s telephone system. An examiner’s suggestion of allowable subject matter may justify indicating the possibility of an interview to accelerate early agreement on allowable claims. The unexpected appearance of an attorney or applicant requesting an interview without any previous notice may well justify the examiner’s refusal of the interview at that time, particularly in an involved case. An interview should be had only when the nature of the case is such that the interview could serve to develop and clarify specific issues and lead to a mutual understanding between the examiner and the applicant, and thereby advance the prosecution of the application. Thus, the attorney when presenting himself or herself for an interview should be fully prepared to discuss the issues raised in the Office action. When it is obvious that the attorney is not so prepared, the interview should be rescheduled. It is desirable that the attorney or applicant indicate in advance what issues he or she desires to discuss at the interview by submitting, in writing, a proposed amendment. This would permit the examiner to prepare in advance for the interview and to focus on the matters set forth in the proposed amendment. In order to have an effective interview, both parties should avoid unnecessary interruptions. Do not take incoming telephone calls, emails, or text messages unless an emergency. All parties participating in an interview should familiarize themselves with the status and existing issues in an application or reexamination proceeding before an interview. The examiner should not hesitate to state, when appropriate, that claims presented for discussion at an interview would require further search and consideration. Nor should the examiner hesitate to conclude an interview when it appears that no common ground can be reached or when it becomes apparent that the application requires further amendment or an additional action by the examiner. However, the examiner should attempt to identify issues and resolve differences during the interview as much as possible. It is the responsibility of all participants to see that the interview is not extended beyond a reasonable period, usually 30 minutes. It is the duty of the primary examiner to see that an interview is not extended beyond a reasonable period. During an interview with a pro se applicant (i.e., an applicant who is prosecuting his or her own case and is not familiar with Office procedure), the examiner may make suggestions that will advance the prosecution of this case; this lies wholly within the examiner’s discretion. Excessive time, however, should not be allowed for such interviews. Examiners should inspect all incoming papers. See MPEP § 714.05. Where a complete reply to a first action includes a request for an interview, a telephone consultation to be initiated by the examiner or a video conference, or where an out-of-town attorney under similar circumstances requests that the examiner defer taking any further action on the case until the attorney’s next visit to a USPTO campus (provided such visit is not beyond the date when the Office action would normally be taken up for action), the examiner, as soon as he or she has considered the effect of the reply, should grant such request if it appears that the interview or consultation would result in expediting the case to a final action. Where agreement is reached as a result of an interview, applicant’s representative should be advised that an amendment pursuant to the agreement should be promptly submitted. If the amendment prepares the case for final action, the examiner should take the case up as special. If not, the case should await its turn. A duplicate copy of a filed amendment and/or remarks may be sent to the examiner in order to facilitate early consideration. A duplicate copy is unnecessary when the amendment and/or remarks are filed via the Office’s electronic filing system (EFS-Web) as the examiner will be able to quickly access such documents. See the EFS-Web Guidance and Resources page of the Office website (www.uspto.gov/patents /process/file/efs/guidance/index. jsp) for additional information. See also MPEP § 502.05. The substance of any interview, whether in person, by video conference, by electronic mail, electronic message system or by telephone must be made of record in the application. See MPEP §§ 502.03 and 713.04. A paper copy of the Internet email contents or instant message system transcripts or video conferencing transcripts, if any, MUST be made and placed in the patent application file as required by the Federal Records Act in the same manner as an Examiner Interview Summary Form is entered. Examiners may grant one interview after final rejection. See MPEP § 713.09. The USPTO has compact disc player equipment available for viewing video discs from applicants during interviews with patent examiners. Attorneys or applicants wishing to show a video during an examiner interview must be able to demonstrate that the content of the video has a bearing on an outstanding issue in the application and its viewing will advance the prosecution of the application. If the video that applicant would like to display during the interview is in a format other than current DVD format, the applicant should also bring to the interview the equipment necessary to display the video. The substance of the interview, including a summary of the content of the video must be made of record in the application. See MPEP § 713.04. Sometimes the examiner who conducted the interview is transferred to another Technology Center or resigns, and the examination is continued by another examiner. If there is an indication that an interview had been held, the second examiner should ascertain if any agreements were reached at the interview. Where conditions permit, as in the absence of a clear error or knowledge of other prior art, the second examiner should take a position consistent with the agreements previously reached. See MPEP § 812.01 for a statement of telephone practice in restriction and election of species situations. Collaboration tools include instant messaging, document sharing and whiteboard, virtual meeting tools, and video conferencing equipment and software. All collaboration tools used for interviews must be supplied by the USPTO and hosted by the USPTO network. A request for an interview prior to the first Office action is ordinarily granted in continuing or substitute applications. In all other applications, an interview before the first Office action is encouraged where the examiner determines that such an interview would advance prosecution of the application. Thus, the examiner may require that an applicant requesting an interview before the first Office action provide a paper that includes a general statement of the state of the art at the time of the invention, and an identification of no more than three (3) references believed to be the “closest” prior art and an explanation as to how the broadest claim distinguishes over such references. See 37 CFR 1.133(a). Applicants seeking prioritized examination should be prepared to participate in an interview with the examiner. See MPEP § 708.02(b). Similarly the Office announced a pilot program in which an interview is conducted before a first action on the merits. Information on this pilot program is available from: www.uspto.gov/patents/init_events/faipp_full.jsp. Seeking search help in the Technology Center art unit should be permitted only with the consent of a primary examiner. The U.S. Patent and Trademark Office cannot act as an expounder of the patent law, nor as a counselor for individuals. Interviews that are solely for the purpose of “sounding out” the examiner, as by a local attorney acting for an out-of-town attorney, should not be permitted when it is apparent that any agreement that would be reached is conditional upon being satisfactory to the principal attorney. A complete written statement as to the substance of any in-person, video conference, electronic mail, telephone interview, or electronic message system discussion with regard to the merits of an application must be made of record in the application, whether or not an agreement with the examiner was reached at the interview. The requirement may be satisfied by submitting a transcript generated during an electronic mail or message exchange. See 37 CFR 1.133(b) and MPEP §§ 502.03 and 713.01. 37 CFR 1.2 Business to be transacted in writing. All business with the Patent and Trademark Office should be transacted in writing. The personal attendance of applicants or their attorneys or agents at the Patent and Trademark Office is unnecessary. The action of the Patent and Trademark Office will be based exclusively on the written record in the Office. No attention will be paid to any alleged oral promise, stipulation, or understanding in relation to which there is disagreement or doubt. The action of the U.S. Patent and Trademark Office cannot be based exclusively on the written record in the Office if that record is itself incomplete through the failure to record the substance of interviews. Accordingly, examiners must complete an Interview Summary form for each interview where a matter of substance has been discussed during the interview. For an applicant-initiated interview, it is the responsibility of the applicant to make the substance of the interview of record in the application file and it is the examiner’s responsibility to see that such a record is made and to correct material inaccuracies which bear directly on the question of patentability. 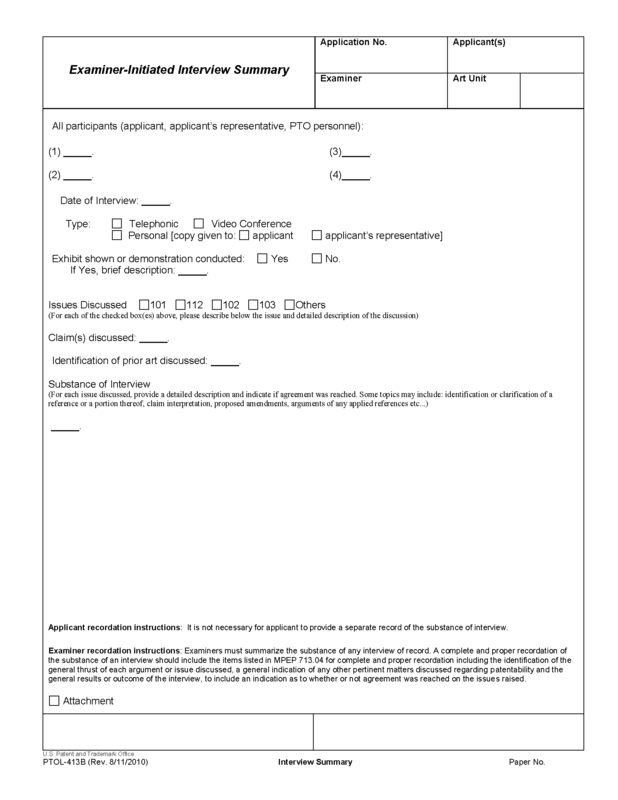 Form PTOL-413, reproduced below, may be used to record the substance of an applicant-initiated interview. For an examiner-initiated interview, it is the responsibility of the examiner to make the substance of the interview of record either on an Interview Summary form or, when the interview results in allowance of the application, by incorporating a complete record of the interview in an examiner’s amendment. Form PTOL-413B, reproduced below, may be used to record the substance of an Examiner-initiated interview. See subsection I below for a list of the items to be included for complete and proper recordation of an interview. Discussions regarding only procedural matters, directed solely to restriction requirements for which interview recordation is otherwise provided for in MPEP § 812.01, or pointing out typographical errors in Office actions or the like, are excluded from the interview recordation procedures. For both applicant-initiated and examiner-initiated interviews, it is recommended the examiner begin completing an Interview Summary form in advance of the interview by identifying the rejections, claims and prior art documents to be discussed. The examiner should complete the “Substance of the Interview” portion of the Interview Summary form at the conclusion of the interview. If applicant initiated the interview using the “Applicant Initiated Interview Request,” a copy of completed form PTOL-413A should be included as an attachment to the Interview Summary form. Upon completion of the interview, a copy of the Interview Summary form should be given to the applicant (or applicant’s patent practitioner) along with any attachments. The Interview Summary form shall include the date the interview was held and the substance of the interview shall be properly recorded. In a personal interview, a duplicate copy of the Interview Summary form along with any attachment(s) is given to the applicant (or applicant’s patent practitioner) at the conclusion of the interview. In the case of a telephonic, electronic mail, electronic message system or video conference interview, the copy is mailed to the applicant’s correspondence address either with or prior to the next official communication. A copy of the form may be faxed or, if the Office has appropriate authorization to conduct communications via the Internet, a copy of the form may be e-mailed to applicant (or applicant’s attorney or agent) at the conclusion of the interview. If additional correspondence from the examiner is not likely before an allowance or if other circumstances dictate, the Interview Summary form should be mailed promptly after the telephonic, electronic mail, electronic message system or video conference interview rather than with the next official communication. (L) names of other personnel participating in the interview. 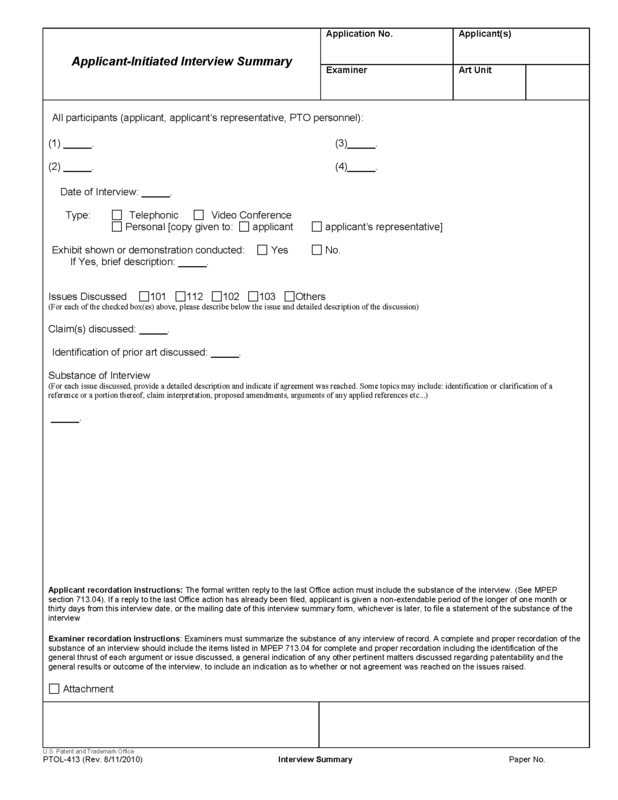 In the case of an applicant-initiated interview, the Interview Summary form will include a reminder indicating it is the applicant’s responsibility to record the substance of the interview. It is desirable that the examiner also orally remind the applicant of the applicant’s obligation to record the substance of the interview in each case where the interview was not initiated by the examiner. Where an interview initiated by the applicant results in the allowance of the application, the applicant is advised to file a written record of the substance of the interview as soon as possible making of record the items listed below to prevent any possible delays in the issuance of a patent. (H) in the case of an interview via electronic mail a paper copy of the contents exchanged over the internet MUST be made and placed in the patent application file as required by the Federal Records Act in the same manner as an Examiner Interview Summary form is entered. Examiners are expected to carefully review the applicant’s record of the substance of an interview. If the record is not complete or accurate, the examiner may give the applicant a 2-month time period to complete the reply under 37 CFR 1.135(c) where the record of the substance of the interview is in a reply to a non-final Office action. The reply filed on  is not fully responsive to the prior Office action because it fails to include a complete or accurate record of the substance of the  interview. Since the above-mentioned reply appears to be bona fide, applicant is given a TIME PERIOD of TWO (2) MONTHS from the mailing date of this notice within which to supply the omission or correction in order to avoid abandonment. EXTENSIONS OF THIS TIME PERIOD MAY BE GRANTED UNDER 37 CFR 1.136(a). 1. In bracket 2, insert the date of the interview. 2. In bracket 3, explain the deficiencies. Applicant’s summary of what took place at the interview should be carefully checked to ensure the accuracy of any argument or statement attributed to the examiner during the interview. If there is an inaccuracy and it bears directly on the question of patentability, it should be pointed out in the next Office communication from the examiner (e.g., rejection, interview summary, or notice of allowability), wherein the examiner should set forth an accurate version of the examiner's argument or statement. If the record is complete and accurate, the examiner should electronically annotate the record with the indication "Interview record OK" on the paper recording the substance of the interview. Except in unusual situations, interviews with examiners are not permitted after the submission of an appeal brief or after a notice of allowability for the application has been mailed. An interview may be appropriate before applicant’s first reply when the examiner has suggested that allowable subject matter is present or where it will assist applicant in judging the propriety of continuing the prosecution. Office employees are forbidden to hold either oral or written communication with an unregistered or a suspended or excluded attorney or agent regarding an application unless it is one in which said attorney or agent is the applicant. See MPEP § 105. Interviews (MPEP § 713) are frequently requested by persons whose credentials are of such informal character that there is serious question as to whether such persons are entitled to any information under the provisions of 37 CFR 1.14. In general, interviews are not granted to persons who lack proper authority from the applicant or attorney or agent of record in the form of a paper on file in the application. A MERE POWER TO INSPECT IS NOT SUFFICIENT AUTHORITY FOR GRANTING AN INTERVIEW INVOLVING THE MERITS OF THE APPLICATION. Interviews are generally not granted to registered individuals to whom there is no power of attorney or authorization to act in a representative capacity. See MPEP § 405 for additional information and for form PTO/SB/84, Authorization to Act in a Representative Capacity. Note that pursuant to 37 CFR 11.106, a practitioner cannot authorize other registered practitioners to conduct interviews unless the client gives informed consent. Furthermore, even with informed consent, a practitioner should not authorize a nonpractitioner to conduct interviews as this could be considered aiding in the unauthorized practice of law. See 37 CFR 11.505. While a registered practitioner not of record may request an interview (if the practitioner is authorized to do so by the applicant or the attorney of record), it is recommended that a power of attorney or authorization to act in a representative capacity be filed, preferably via EFS-Web, prior to the interview. Registered practitioners, when acting in a representative capacity, can alternatively show authorization to conduct an interview by completing, signing and filing an Applicant Initiated Interview Request Form (PTOL-413A). This eliminates the need to file a power of attorney or authorization to act in a representative capacity before having an interview. However, an interview concerning an application that has not been published under 35 U.S.C. 122(b) with an attorney or agent not of record who obtains authorization through use of the of the interview request form will be conducted based on the information and files supplied by the attorney or agent in view of the confidentiality requirements of 35 U.S.C. 122(a). Interviews normally should not be granted unless the requesting party has authority to bind the principal concerned. 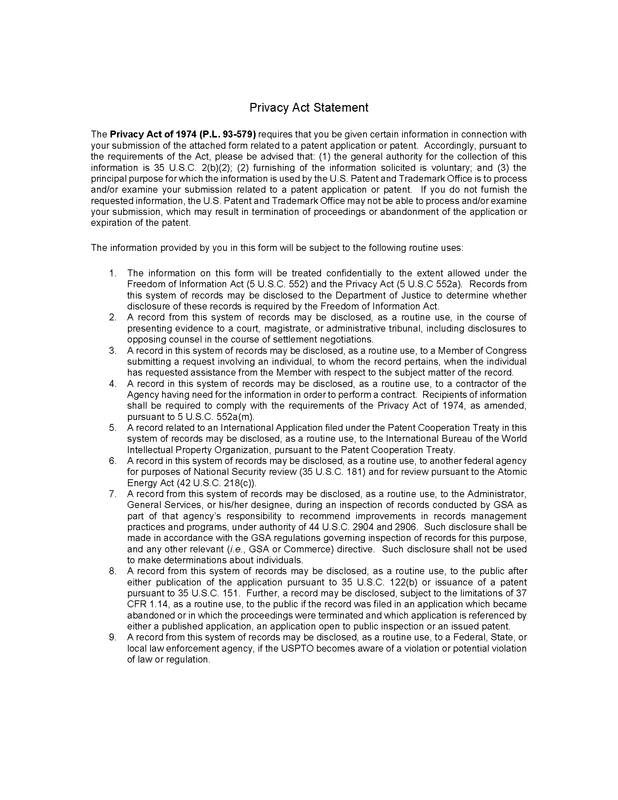 The use of the provisions of 37 CFR 1.34 by a third party or its representative to conduct an interview, or take other action not specifically permitted by the rules of practice in an application for patent, will be considered a violation of 37 CFR 11.18 and may result in disciplinary action if done by a practitioner. See MPEP § 410 for a discussion of violations of 37 CFR 11.18. For an interview with an examiner who does not have negotiation authority, arrangements should always include an examiner who does have such authority, and who is familiar with the application, so that authoritative agreement may be reached at the time of the interview. For attorneys remote from the Washington, D.C. area who prefer in-person or video conference interviews, the grouped interview practice is effective. 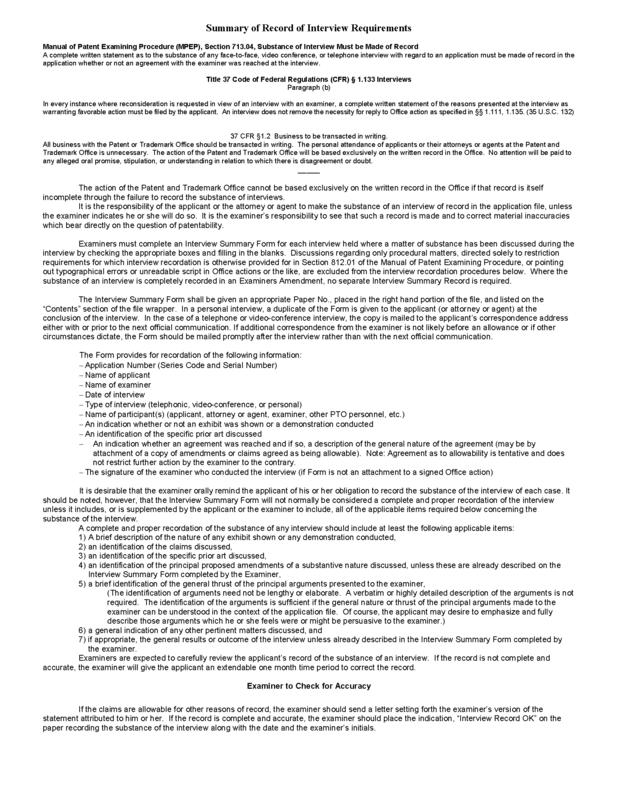 If in any case there is a prearranged interview, with agreement to file a prompt supplemental amendment putting the case as nearly as may be in condition for concluding action, prompt filing of the supplemental amendment gives the application special status, and brings it up for immediate special action. The examiner may not discuss inter partes questions ex parte with any of the interested parties. Prior to an interview in the examiner’s office space or via video conference, the examiner should arrange his or her desk so that all files, drawings and other papers, except those necessary in the interview, are placed out of view. See MPEP § 101. The invention in question may be exhibited or demonstrated during the interview by a model or exhibit thereof. A model or exhibit will not generally be admitted as part of the record of an application. See 37 CFR 1.91. However, a model or exhibit submitted by the applicant which complies with 37 CFR 1.91 would be made part of the application record. See MPEP §§ 608.03 and 608.03(a). If the model or exhibit is merely used for demonstration purpose during the course of the interview, it will not be made part of the record (does not comply with 37 CFR 1.91). A full description as to what was demonstrated/exhibited must be made of record in the application. See 37 CFR 1.133(b). Demonstrations of apparatus or exhibits too large to be brought into the Office may be viewed by the examiner outside of the Office (in the Washington, D.C. area) with the approval of the supervisory patent examiner. It is presumed that the witnessing of the demonstration or the reviewing of the exhibit is actually essential in the developing and clarifying of the issues involved in the application. Normally, one interview after final rejection is permitted in order to place the application in condition for allowance or to resolve issues prior to appeal. However, prior to the interview, the intended purpose and content of the interview should be presented briefly, preferably in writing. Such an interview may be granted if the examiner is convinced that disposal or clarification for appeal may be accomplished with only nominal further consideration. Interviews merely to restate arguments of record or to discuss new limitations which would require more than nominal reconsideration or new search should be denied. See MPEP § 714.13. Interviews may be held after the expiration of the shortened statutory period and prior to the maximum permitted statutory period of 6 months without an extension of time. See MPEP § 706.07(f). A second or further interview after a final rejection may be held if the examiner is convinced that it will expedite the issues for appeal or disposal of the application. For interviews after notice of appeal, see MPEP § 1204.03. After an application is sent to issue, it is technically no longer under the jurisdiction of the primary examiner. 37 CFR 1.312. An interview with an examiner that would involve a detailed consideration of claims sought to be entered and perhaps entailing a discussion of the prior art for determining whether or not the claims are allowable should not be given. Obviously an applicant is not entitled to a greater degree of consideration in an amendment presented informally than is given an applicant in the consideration of an amendment when formally presented, particularly since consideration of an amendment filed under 37 CFR 1.312 cannot be demanded as a matter of right. Requests for interviews on cases where a notice of allowance has been mailed should be granted only with specific approval of the Technology Center Director upon a showing in writing of extraordinary circumstances.